How Portable is a Blowup spa? - We Found the Answer for you! How Portable is a Blowup spa? Just what is an inflatable spa? It might sound too good to be true but it’s actually exactly that — a hot tub that is inflated with air. And to add more, it is also portable. So, how does it work? And just how portable is it? An inflatable hot tub is made of flexible and extremely durable material. So you can actually bring it anywhere outdoors. The material of inflatable hot tubs is tough enough to hold a large amount of moving water and a number of individuals inside it. Generally, blow up spas are smaller than built-in hot tubs. This is to make it easier to transfer and carry from one place to another. The size is one of the differences between a portable and built-in hot tub. In addition to that, inflatable hot tubs need ample air to make it erect and stable. Inflatable hot tubs are designed with water inlets and massage jets where the water would pass through. Just like the built-in hot tub that is permanently connected to the water source and heater, the portable hot tub has it’s own heater and pump to maintain the right temperature. 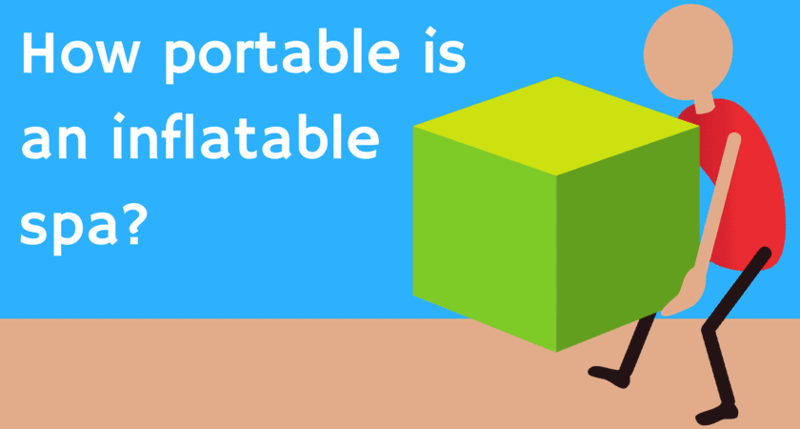 How portable is the inflatable hot tub? Well, you can bring it to many places but you probably shouldn’t bring it somewhere without an accessible water supply. Unless you are willing to bring tons of water to fill it up. You should also consider the ground where you will be placing the blow-up spa. The ground must be stable enough to support the weight of the tub, water, and people who will soak in it. You should also make sure that there is an available power source if you are going to use an electric air and water pump. If there is none, you should bring a portable power source, as well. The inflatable hot tub also comes with a water testing kit for water safety. It is to make sure that the water which you will be using is not harmful to the people who will bathe in it, and for the material of the tub. If it does not include a testing kit, you can purchase a water testing kit to ensure water safety. So how portable are they? An inflatable tub is the most portable of all hot tubs because you can deflate it after use. You can also carry it anywhere because it usually comes with its own box or bag. It is compact, so you can also store it easily. You can also install it in your home for long-term or permanent use if you like. But you can still bring it anywhere when you feel the need to travel or go camping. Moreover, an inflatable hot tub lets you experience bathing in a hot tub without much expense. It is much cheaper than having an in-ground tub installed in your yard. And the best thing about it is that you can bring it anywhere you want to and share it with your friends. Check out these 6 important tips before you buy your hot tub.